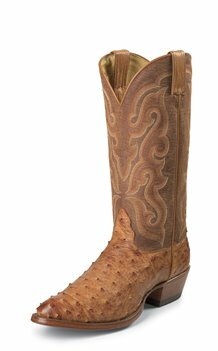 The Randy Cognac Full Quill is a 13-inch tall Men's exotic boot featuring a golden chestnut leather upper with tonal stitching that compliments this boot's unique hue. The full quill ostrich vamp is distressed and textured for a vintage feel and the single stitch welt offers durability. The narrow round toe and standard heel allow for a relaxed fit and cushioned insole provides support for lasting comfort throughout the day. This style is proudly Handcrafted in the USA with imported materials.